It seems acquisition is the name of the game for MinRex Resources (ASX:MRR) as it looks to take the metals marketplace by storm in 2018. Hot on the heels of an acquisition of East Pilbara gold tenements that it finalised in February, MRR has dropped more big news on the ASX. News today it that MRR is acquiring three highly prospective assets in NSW and WA that are prospective for cobalt, scandium, copper and nickel. MRR has agreed to purchase 100% of the issued capital of Clean Power Resources Pty Ltd (CPR), the owner of the three high-quality project areas — the Pacific Express Project in NSW and the Knight and Dragon projects in WA. 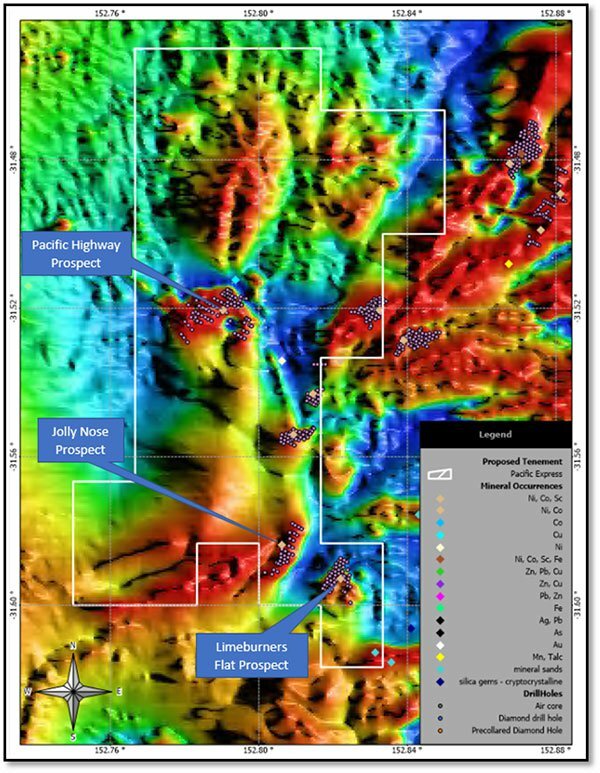 The Pacific Express project (NSW) has cobalt-nickel-scandium laterite mineralisation with a legacy JORC (1996) Indicated Resource of 4.6Mt at 0.09% cobalt, 40 g/t scandium and 0.61% nickel. According to recent satellite imagery from the site, there is plenty of room to expand those figures. 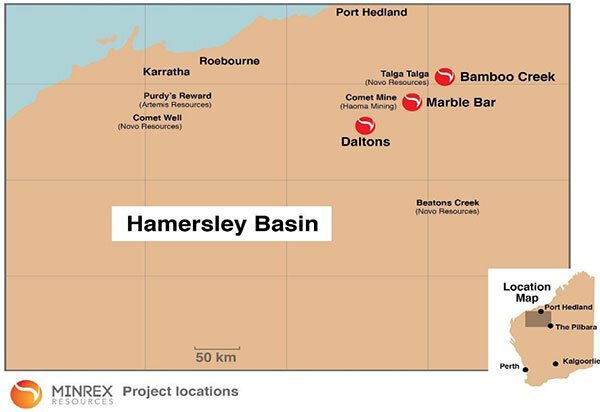 The Knight Project and the Dragon Project in the golden state of WA are not far from an important piece of land owned by St George Mining (ASX:SGQ), which holds the Mt Alexander prospect. 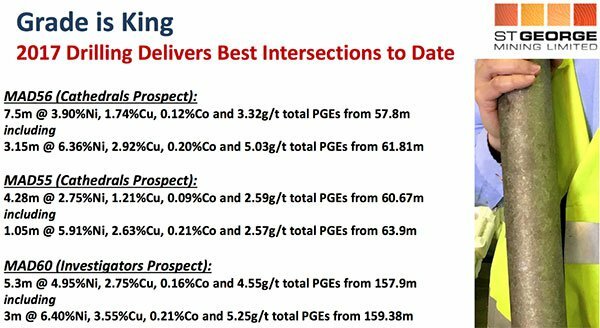 The highly prospective region was given a reputational boost when SGQ confirmed high-grade mineralisation at Mt Alexander, including 3 metres at 6.4% nickel, 3.6% copper and 0.2% cobalt. 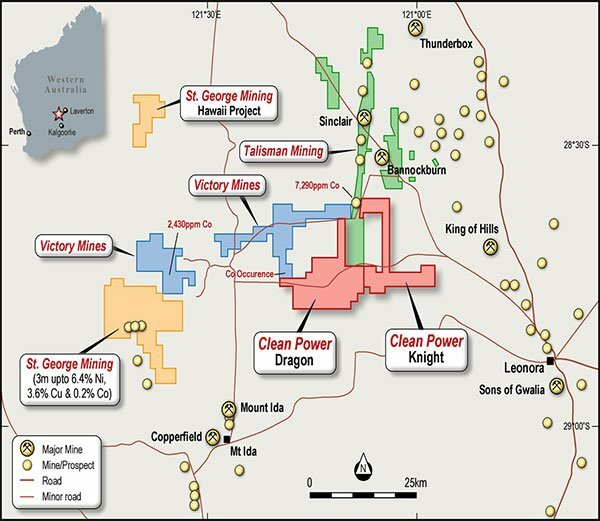 Meanwhile, Talisman Mining (ASX:TLM) hold land that’s contiguous to the Knight and Dragon projects, and those top-shelf tenements produced 38,500 tons of nickel between 2008-2013 at an average grade of 2.44%. That being the case, MRR’s geology team is feeling confident and plans to fast-track a desktop review and assessment of legacy data compliant with the 2012 JORC code as soon as all acquisition due diligence has been executed... which could mean a Resource upgrade in the very near-term for MRR. Although it is still early stage and investors should seek professional financial advice if considering this stock for their portfolio. Once thing’s for sure — all three projects are highly opportunistic grabs for MRR, each boasting promising drill results and proximity to supporting infrastructure and key ports (Newcastle in NSW and Esperance in WA). And they’ve come along for MRR at exactly the right time, as the market witnesses an exceptional increase in demand for specialty metals like cobalt and scandium, thanks to their use in lithium-ion batteries. Any company with exposure to these kinds of metals in today’s climate, can see a pretty clear path towards creating significant shareholder value on the back of escalating hunger for these metals. So how did it get hold of these three high-potential, ideally timed projects? Through an acquisition agreement with Clean Power Resources. A non-refundable $100,000 deposit, 1 million ordinary MRR shares upon execution of the agreement. 29,000,000 fully paid ordinary MRR shares together with one option to acquire a Share for every two Shares issued (exercisable at $0.15 and expiring 3 years from date of issue). 13,350,000 Performance Shares that each convert into one Share on the achievement of a resource of a minimum of 1mt tonnes of nickel grading of at least 0.5% or 1mt of cobalt .05% or 1mt or scandium grading greater than 20ppm. A 2% net smelter return royalty with respect to all minerals produced and sold from the tenements. Time to look at the each project in a bit more detail to see exactly what MRR has its sights set on. 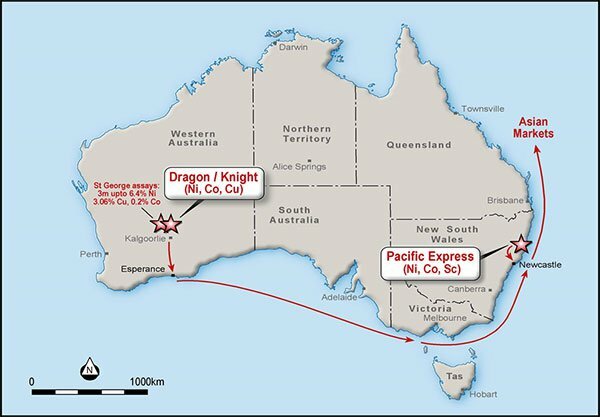 Pacific Express, the fast way to metals success? 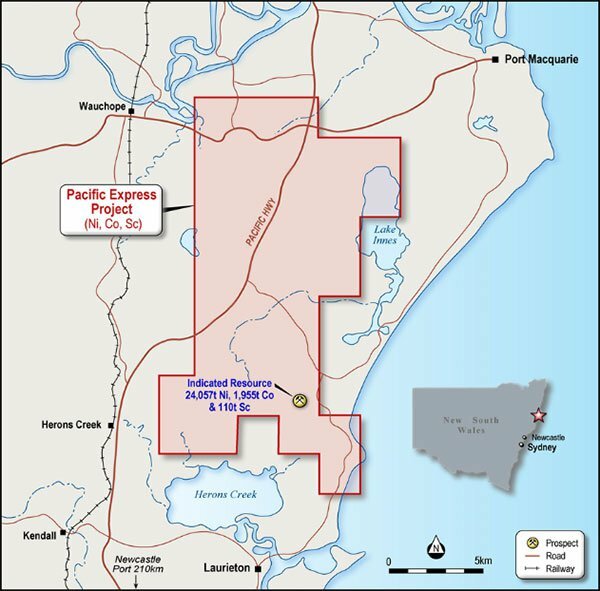 The Pacific Express project, located near Port Macquarie, is particularly attractive thanks to the significant exploration upside for nickel, cobalt and scandium laterite mineralisation at the site. Legacy data has already been utilised to generate an Indicated Resource, as per JORC (1996) code, with 4.6Mt at 0.09% copper, 40g/t scandium and 0.61% nickel. The geology team at MRR has been reviewing recent magnetic intensity data and reached the conclusion that the Indicated Resource will very likely be expanded as the project is explored further. The team also believe a modern-day desktop review (which is planned for as soon as the acquisition is done and dusted) could expedite re-evaluating the Resource and potentially deliver an upgrade on its own. 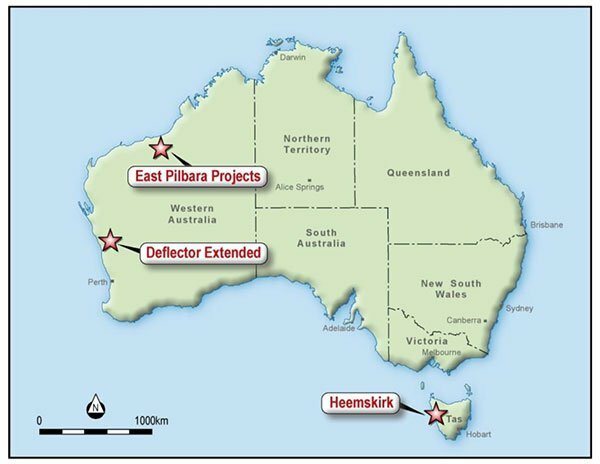 Three prospective drill targets (in the image below) have already been selected by MRR’s team within the Pacific Express project — Pacific Highway, Limeburners Flat and Jolly Nose prospects — and will be top priorities for the small-cap post acquisition. This is the same region where fellow explorer Jervois Mining (ASX:JRV) drilled 506 holes over seven years, reporting a total JORC 1996 Resource of 11.4Mt at 0.76% nickel and 0.11% copper and 40g/t scandium. It’s clear there’s serious metal-containing mineralisation in the region that’s there for the taking. MRR has found a strategic way in, and at a very opportune time. The acquisition of the Pacific Express project would be major news enough, yet there’s plenty more to delve into from today’s announcement. The second and third projects involved in the acquisition provide all the more reason for MRR’s shareholders pay attention. Obviously the Dragon and Knight projects are right in the thick of the action going in in the region. Legacy assay results have already confirmed the relationship between sulphide mineralisation and magnetic anomalies typically related to dykes or ultramafic volcanic rocks. In layman’s terms, this benefits MRR because it can be more cost effective to extract economic minerals hosted within sulphides. 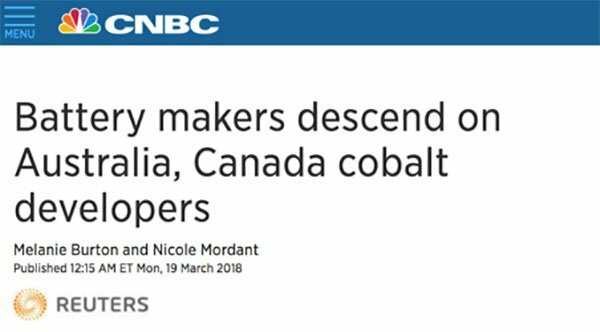 Considering the blue metal recently hit US$90,000 per ton on the London Metal Exchange — and is undoubtedly the talk of the town right now, as far as ‘clean energy’ metals goes — MRR will be looking to shore up some solid data on the projects’ prospectivity for cobalt. It should be noted here that demand for commodities does fluctuate and therefore investors should maintain a cautious approach to any investment decision made with regard to these commodities. 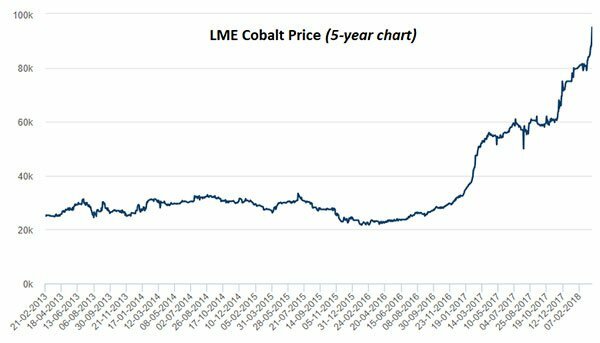 Notably, legacy data shows record cobalt hits from 2,430ppm up to 7,290ppm just outside the Knight project. Bolstering MRR’s confidence in the two projects, there is geophysical evidence that suggests that Knight and Dragon’s geology (and mineralisation sequences) could well be analogous to neighbours SGQ and TLM’s deposits. Considering a recent drill programme from SGQ delivered resulting including 3 metres up to 6.4% nickel, 3.6% copper, 0.2% cobalt, we would call this a positive sign. As we touched on earlier, TLM’s tenure is contiguous in parts to the Knight and Dragon projects, and it produced 38,500 tons of nickel between 2008-13 at an average grade of 2.44%. MRR’s geology team has reviewed satellite imagery illustrating SGQ’s east-northeast geophysical magnetic anomaly (indicated by the red box in the below image, and ‘zoomed in’ in the image beneath it). 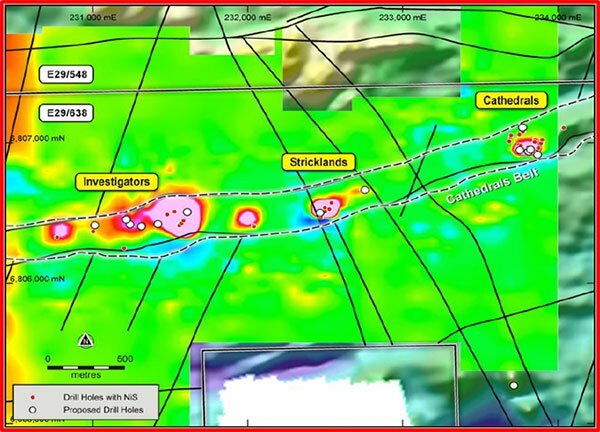 They found that it ‘constrains SGQ’s three prospects (Investigators, Stricklands and Cathedrals) as a regional dyke that controls Co-Ni sulphide mineralisation’. Knight and Dragon both have a strong magnetic anomaly which aligns to the same ENE trend SGQ’s prospects cover. Adding some weight to that, in March last year SGQ argued that the ultramafic aligned ENE in the Yilgarn craton is actually the dominant mineralisation. These could all be highly favourable signs for MRR’s latest acquisition. In February, MRR confirmed it had completed the acquisition of three projects in WA’s East Pilbara, giving it a strong foothold in the gold-prospective region. In cementing the acquisition deal, MRR had a bit of help from the $122.4 million capped Artemis (ASX:ARV) as a strategic partner, which assisted with a $250,000 cash injection. ARV has an interesting story of its own, and at Next Investors we called the small-cap late in 2016 when its share price was around 2 cents per share — ARV now trades at 23.5 cents. We can only hope for the same for its up-and-coming partner, MRR. Looking at the newly acquired East Pilbara tenements, of particular interest is the Marble Bar Project which returned excellent results from rock chip samples taken at the end of last year. 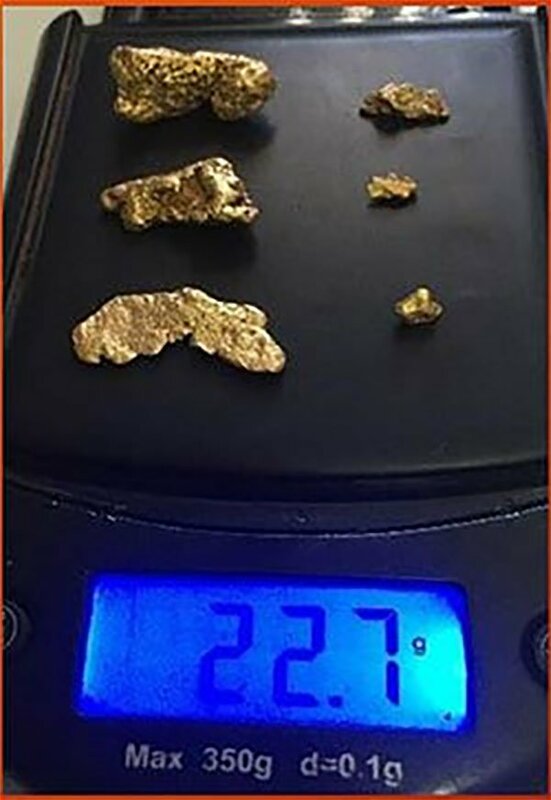 All samples returned anomalous gold values maxing out at 17.1g/t gold and an average of 2.6g/t gold, and five of the samples exceeding 1g/t gold. The samples were taken from old gold workings and diggings which are not recorded in the Department of Mines, Industry Regulation and Safety databases. The bigger picture: MRR set to dominate in metals? MRR have so much in the pipeline — gold, cobalt, nickel, copper and scandium exploration — as well as $3 million in cash as at last report (31 December 2017). At a bare minimum, MRR is pretty well guaranteed to produce some serious news flow in the near-term. It does remain a speculative stock and investors should seek professional financial advice if considering this stock for their portfolio. With upcoming exploration activity planned at both its NSW and WA projects, it’s likely you are going to hear a lot more about this busy explorer, particularly as things heat up for Australian base/specialty metals exploration across the board. Hold tight, it could be a bumper 2018.